Oregon’s rural university has partnered with a growing number of small-town high schools to take a new approach in solving the rural teacher shortage. It might seem unbelievable that Oregon public schools are facing a teacher shortage crisis. Educators across the state worry every spring that they might lose their positions due to budget cuts, so how can there be a shortage of teachers if there are fewer and fewer job openings? The answer is clear to those who live in Oregon’s rural school districts. There are several factors that have led to the current situation in our rural communities. When a position needs to be filled in places like Portland, Beaverton, Eugene, and even Bend, school administrators can receive upwards of 100 applications. In Coos Bay, Klamath Falls, or Condon, there might only be one or two candidates applying for the job — or there might be none. Few qualified people generally reside in these small communities, and it is difficult to attract educators from metropolitan areas to come work and live in such a drastically different atmosphere. Many applicants are new teachers, fresh from student teaching, looking for a way to gain some experience before they move on to opportunities in bigger districts, or decide to leave the education field altogether. Because of this, the turnover rate for teachers in rural areas is exponentially higher than it is in mid-sized and large cities. To top it off, the number of graduates from teacher-prep programs has declined dramatically in the past decade, reducing the pool of applicants that rural school districts have to draw from. These issues are not unique to Oregon. Any educator from any rural community in any state can echo these concerns, but what can be done to solve the problem? The Oregon Teacher Standards and Practices Commission has done what it can in recent years to help alleviate some of the strain by issuing hundreds of provisional licenses to under-qualified candidates and lifting regulations on the number of days that substitutes can work during a school year. This has helped some, but these temporary measures are unsustainable and do not provide a long-term solution to a growing problem. Rural schools need to recruit new, talented educators — and even more importantly — keep them. But how? 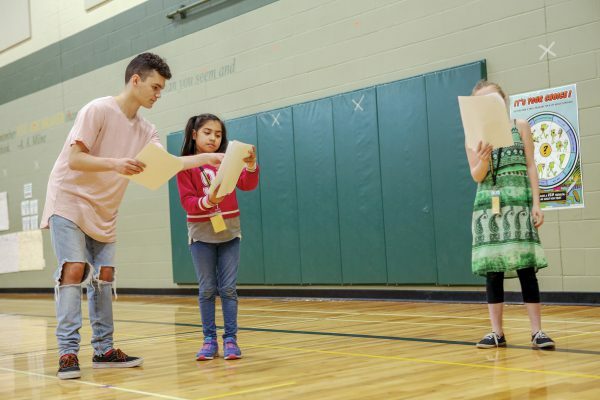 The class is a year-long commitment, and the high school students mentor the same elementary school class for the whole year. They prepare lessons for the youngsters and teach small groups once a week. In 2014, the Oregon Department of Education issued a request for grant proposals to expand the pipeline into the education field for the next generation of teachers. Tawnya Lubbes, who was an Assistant Professor of Education, the ESOL Program Coordinator, and the Director of the Center for Culturally Responsive Practices at Eastern Oregon University at that time, applied for and received $178,000 to develop a program that created a path for rural high school students to become educators. Lubbes’ team used the initial grant funding to do intensive research and training on a model that was used in the Denver, CO area to encourage high school juniors and seniors to consider a career in teaching through partnerships between the local college and high schools. While they received a wealth of information and great ideas, Lubbes realized that this urban program needed some major adjustments to fit the needs of rural eastern Oregon. “It was really important to us that we had a true pathway that led not only from high school to college, but to mentoring throughout college and beyond,” says Lubbes. With this vision in mind, the Oregon Teacher Pathway (OTP) program began to take shape. The first step in developing the program was to recruit partner schools. In order to be part of the pilot, high school administrators had to commit to staffing an Introduction to Education class. In the midst of a teacher shortage, adding one more class to a teacher’s load can be tricky, but it is a crucial piece of the program. The full-year course is devoted to exploring students’ teacher identities, learning culturally responsive teaching practices, and building skills in lesson planning and delivery. It also includes a practicum portion which requires students to spend one hour per week working with elementary students. 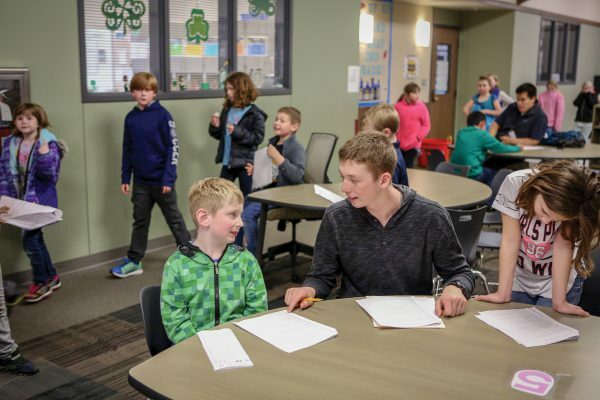 The class is paired with the same elementary students for the whole year, so they get a more realistic classroom experience and build a relationship with their students. “There’s the accountability factor of preparing [lessons], in a very small way, but they start to see themselves as teachers,” says Lubbes. Students must also complete a college-level research project to present on campus at EOU’s annual research symposium, alongside EOU students. 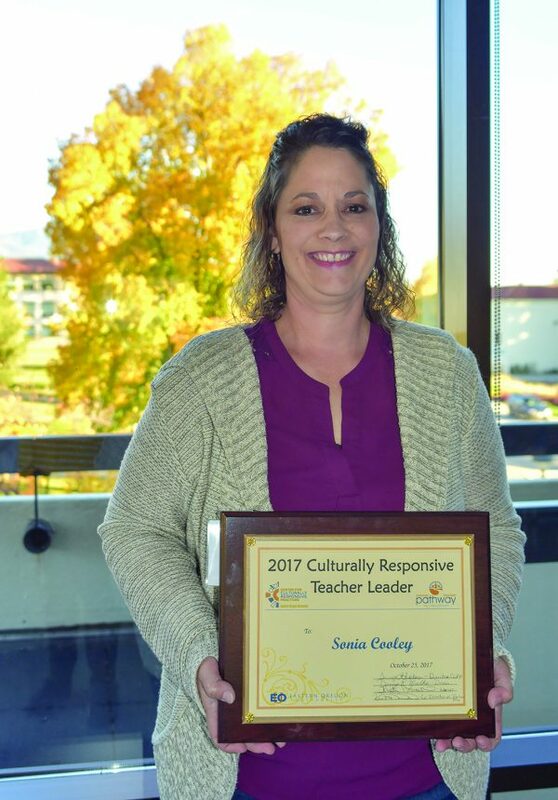 Sonia Cooley was recognized in 2017 for her work as an advocate and mentor through OTP, and was awarded the EOU Culturally Responsive Teacher Leader award. To keep things manageable, the pilot was limited to only three high schools in the first year. Sonia Cooley, a Language Arts teacher in Pendleton, has been the Intro to Education instructor since the partnership was adopted at Pendleton High School in mid-2014. “Our principal sent out an email to the whole staff to find out if anyone was interested in teaching the class, and I was apparently the only one who responded,” she says with a laugh. Cooley also teaches a college and career readiness course for juniors, so she is able to recruit students who have shown an interest in teaching to take Intro to Education. She thinks of it as a great way for students to get their feet wet and narrow down their career path, even if they don’t end up in the education field. “There are some that take the class, and decide that teaching isn’t for them, which I think is just as valuable,” she says. 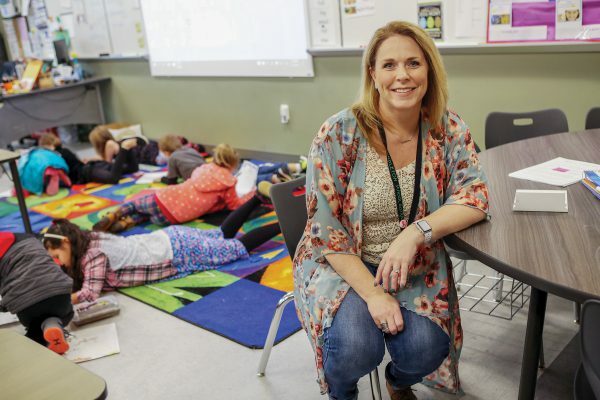 It’s the smallest class she teaches, with 12-13 students a year, and Cooley says that the small group makes students feel more comfortable sharing their experiences. “For the class discussions that we have, it’s nice. We talk about stuff that can be pretty sensitive at times,” she says. One of the most important pieces of the curriculum is the focus on educational inequality and culturally responsive teaching. Student populations across the state have become increasingly diverse, and eastern Oregon is no exception. The program is inclusive to any student who wishes to join, but of the nearly 100 high school students currently enrolled in Oregon Teacher Pathway, 50 percent are students of color. A major goal of the program is to educate students in the importance of being culturally responsive people, even if they find they don’t want to teach. Cooley says that being able to teach this class has helped her to hone her own practice by forcing her outside her comfort zone. “Sometimes I still struggle with talking about cultural diversity because I’m afraid I’m going to offend somebody, so it’s kind of opened up my eyes,” she says, “I’m still learning, and it’s really important to [talk about].” Cooley was recognized in 2017 for her work as an advocate and mentor through OTP, and was awarded the EOU Culturally Responsive Teacher Leader award. Students in Sonia Cooley's Pendleton High School class visit Sherwood Heights Elementary to mentor Diana Ellis's second graders. The goal of the program is to attract local-area high school students to the education field and encourages them to pursue their education at EOU through a huge tuition discount. This year, Cooley’s class is partnered with a second-grade class at Sherwood Heights Elementary, taught by Diana Ellis. Both classes have students who are ethnically and linguistically diverse, and possibly one of the biggest impacts of their weekly time together is the exposure of the younger students to respected leaders who look like them and speak their languages. The OTP students also have a great opportunity to put their culturally responsive teaching practices to work as they navigate the different learning styles of their young students. The second-graders have learned to expect them every week, and their little faces light up when they see their “teachers” coming into the classroom. Pendleton High School student Gage Jones works with second graders from Sherwood Heights Elementary School. Jones is taking a college-level intro to education course, which includes an elementary student mentoring piece. The incentive to be part of OTP is pretty sweet. Not only can they earn four college credits from EOU just for taking the Intro to Education course, but should they decide to enroll in the education program at EOU, they are eligible for about $5,000 per year in tuition remission for the full four years of the program. The number of educators in the U.S. who are buried under mountains of student loan debt is at an all-time high, so the prospect of obtaining a degree without signing on to a lifetime of debt is very appealing. The program aims to remove as many barriers as it can for young people who want to become an educator in order to provide what Lubbes calls a “true pathway” into the education field. In return for the deep discount, students have to commit to mentoring incoming classes of students. Freshmen in the program at EOU come back to their high schools to mentor junior and seniors, and upperclassmen serve as mentors for freshmen and sophomores in the education program at EOU. “I get to see all my graduates back here, they’re required to make a visit every term to their old classroom to share how things are going,” says Cooley. Students who were part of the first year of the pilot will be graduating this year, and the hope is that they have built strong connections in their communities, encouraging them to return as teachers. This program is not just for rural residents. Since 2014, the Oregon Teacher Pathway has expanded into three additional high schools in eastern Oregon with several more rural high schools signed on to participate next year, but Lubbes has already begun to forge partnerships with schools in the Portland-Metro area and is piloting a community college as well. Providing the FTE for an instructor to teach the class is one of the major roadblocks to implementing the program in urban schools and community colleges, but as the program continues to be successful, Lubbes is confident that more districts will see the benefit of providing students with a pathway into the education field and will find the time and funds to commit. In her February State of the State speech, Governor Kate Brown pledged to make career technical programs at the high school level — especially those that will improve rural job opportunities — a funding priority. If the Oregon Teacher Pathway model can be implemented statewide, it would not only create jobs, but it also just might change the tide for Oregon’s rural teacher shortage.